The compass points to the North this weekend and the weather looks glorious for being that far up in the UK. Despite the unbearable heat and the show starting around 8 (and the sun is not even close to setting even so late in the afternoon), the Head of Steam in Newcastle is already full of people coming from both the city and the rest of England to enjoy a promising show. 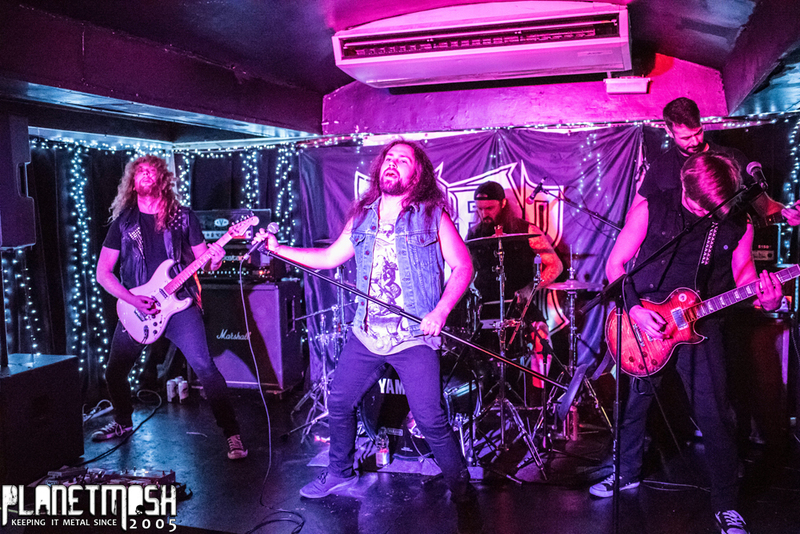 First act on stage is Southampton’s heavy metal band Toledo Steel. Having seen the band lately in lots of concerts in various venues all over the country, the band promised their longest set so far (apart from their album release show in London a couple of months ago) and started conquering the stage dynamically with raging drums and furious guitar riffs. The set comprised of old and new songs, some of which were from their newest release (even some they don’t usually play which was a pleasant surprise) and some from their oldest releases. 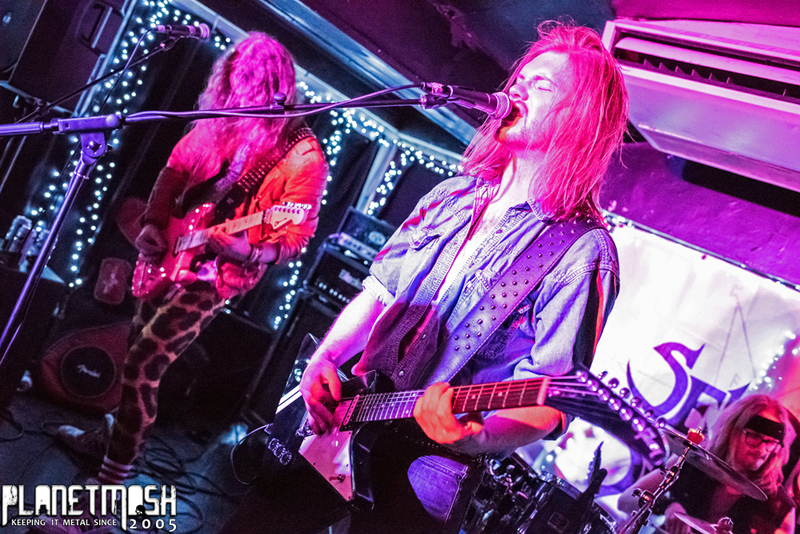 The venue seemed to be tightly packed with people fist-pumping to the melodies and riffage and singing along to the biggest part of the set, all of them having a good time – both fans and the band. Toledo Steel seem to always have a lot of energy and confidence on stage, always deliver a good show and they remain loyal to their roots, playing songs that people love but also adding their new stuff in between, without breaking the atmosphere. A big highlight was people head-banging like maniacs and singing along to their Judas Priest cover “Heading out to the Highway”, followed by a massive outburst for the band’s own songs that people seem to particularly love “City Lights” and the last song of the set “Black Widow”. Next band was Seven Sisters. With the temperature rising already, people being warmed up to head-band and sing along, the London-based heavy metal band hits the stage shortly after. Again, the Seven Sisters set is nothing new to me, after seeing them multiple times in their hometown. However, what is always striking with the band is the choice of outfits the guitarist Graeme Farmer seems to have. 80s leopard spandex, shining gold top and a gleaming fire-red leather jacket, along with a hot pink guitar and everyone in the crowd is instantly intrigued. First song, “Highways of the Night”, from their first full length album is all it takes to fire up the spark that Toledo Steel left after their set and the crowd is cheering and singing along crazily again. Seven Sisters always know how to play a good show, they are always guaranteed a good band to see with twin lead and lots of solos. In their new album, which was the biggest part of their set, guitar solos conquer and synchronise, and all I can see is hair from people head banging and shouting. Even though their album is also a new release, the crowd’s response and sing along was also massive (even to the amazing power ballad where people held lighters in the air), only to be topped up by the all-time fan favourite “Lost In Time” as the final song of the set. All in all, it was a very energetic and dynamic (and certainly very pleasant) performance. My last thoughts were that I’d love to see these two bands perform together again soon.